Wolverhampton Wanderers midfielder Mark Davies has signed for Premier League side Bolton for an undisclosed fee. Davies has signed a four-and-a-half year deal with Bolton after last week handing in a transfer request. The 20-year-old had been out on loan at League One leaders Leicester, but was left out of the Foxes' squad for Saturday's home game with Huddersfield. 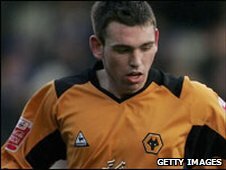 The highly-rated midfielder had risen through the ranks at Molineux making his first team debut in August 2005. Telford-born Davies was considered a superb prospect when he first broke through from the Wolves academy four years ago. He was rated as the club's best home-grown product since Robbie Keane by then Wolves academy director Chris Evans, who is now on the coaching staff at Bolton under manager Gary Megson. Davies did well when handed his first-team chance under Glenn Hoddle at Wolves, becoming almost a regular over the latter half of the 2005/06 season. But a pre-season knee injury just a fortnight after Mick McCarthy took over as manager in July 2006 put his career on hold and he missed all of the 2007/08 campaign. He made a goalscoring appearance for Wolves in the 3-2 Carling Cup win over Accrington Stanley in August, before going out on loan to Nigel Pearson's Leicester in November.